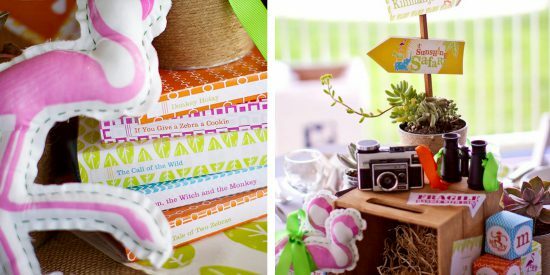 With printables from yours truly, and cute products from Pottery Barn Kids, 10 designers put together some of the most beautiful and original centerpieces I have ever seen! And thanks to Jackie Culmer Photography and Nicole Benitez Photography, you get to see them too. Paper & Cake was honored to decorate 3 of the tables. Here are our centerpieces and napkin treatments. E is for Elephant! 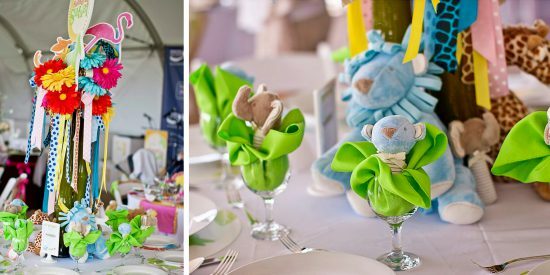 Each table we designed featured one of the safari animals, handmade into a cute stuffie, next to a large wooden letter from Pottery Barn Kids. We also incorporated globe alarm clocks and newborn onsies with embroidered animals. 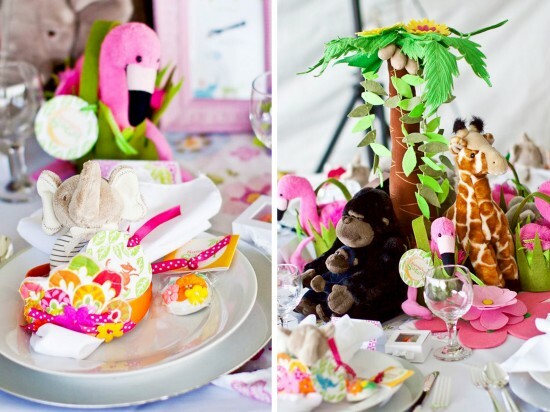 Adorable Flamingo table! We mixed in different elements to get an “explorer” feeling to our tablescapes. Check out the vintage cameras and binoculars. The Zebra table was a hit! I mean look at those stuffed animals! To round out the centerpiece, we paired small patterned favor boxes (filled with chocolates) with mini succulents in jute wrapped containers. And now a look at the other designers beautiful work! 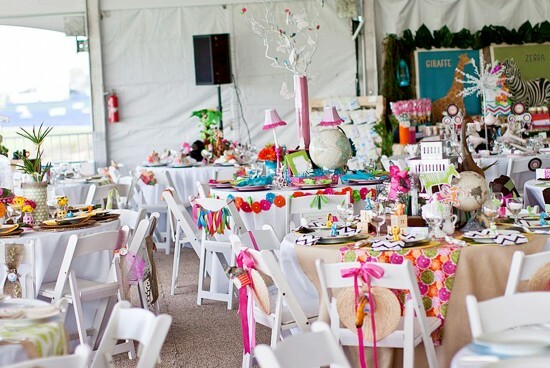 The TomKat Studio took a bright and colorful approach to their table with a gorgeous chair back design. Tori from Thoughtfully Simple used some beautiful pops of orange and pink, with just enough greenery. It reminded us of the rainforest- gorgeous! 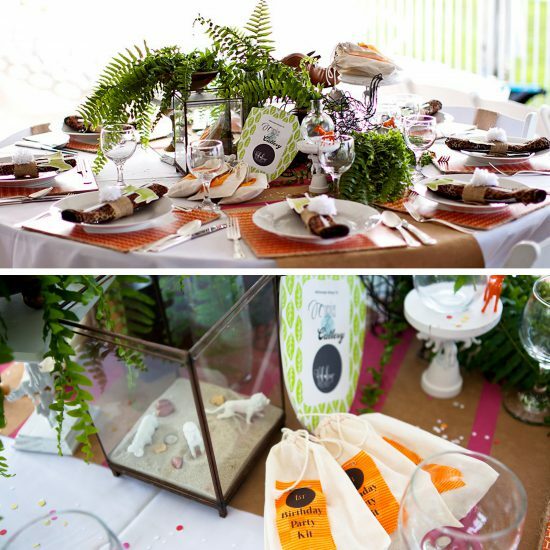 Cupcakes and Cutlery showcased the safari theme in such an elegant and sophisticated light, we were so excited to have our table next to theirs! 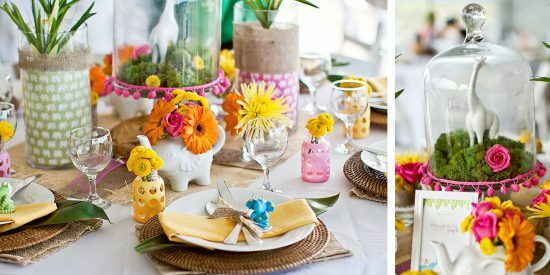 Rebekah from A Blissful Nest amped up her table with a bundle of patterns and colors, and topped it off with some ridiculously cute animals like this giraffe. Personal favorite- those chevron napkins! Umm hello? Fab. Giraffe. Figurines…..beautiful! 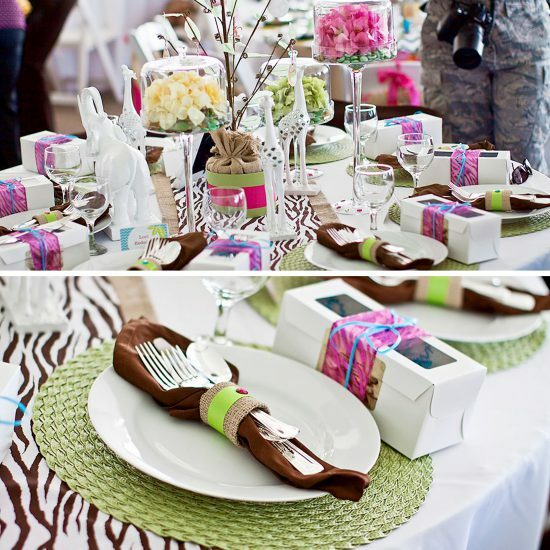 A to Zebra Celebrations‘ simple, yet lovely table design won over the moms to be with those party favors! 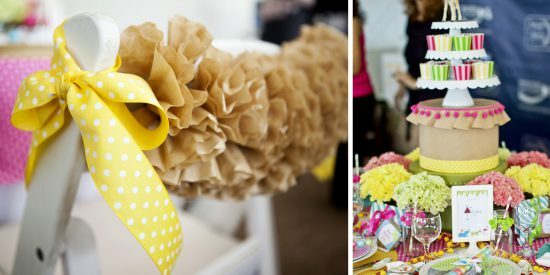 This table design from Your Bash towered above the rest with a fun and bright ribbon centerpiece. And of course we loved the huge safari animal cutouts! 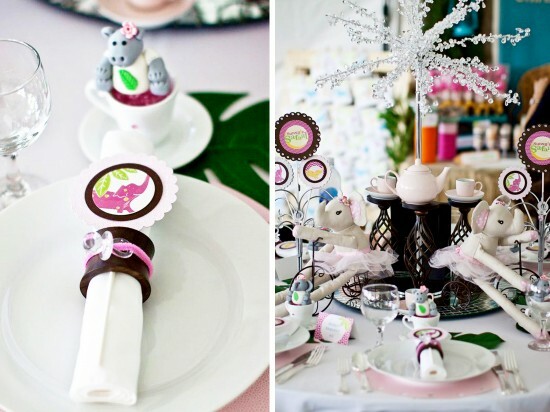 Tea party anyone? 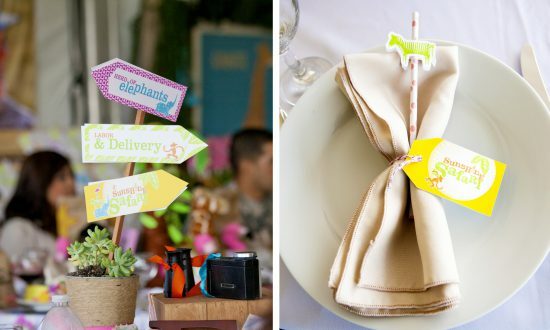 Soireé-Event Design created one heck of a cute safari tea party table. 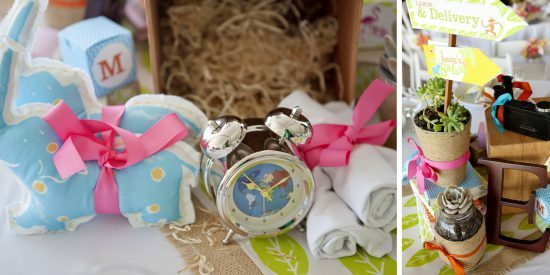 Love the mini pacifier napkin rings! More stuffed animals… yes please! 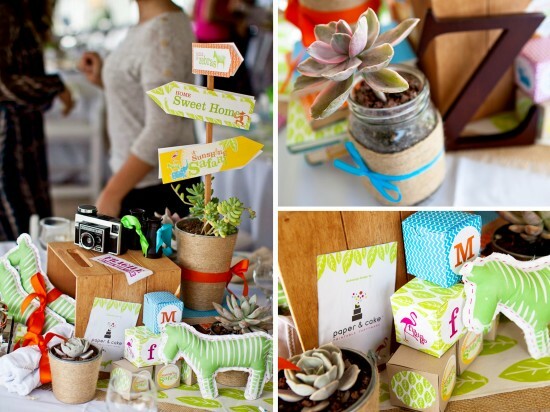 Shawna Brockmeier Styled Events came up with this cute and cuddly design. The moms and their husbands who sat at this table just loved it! 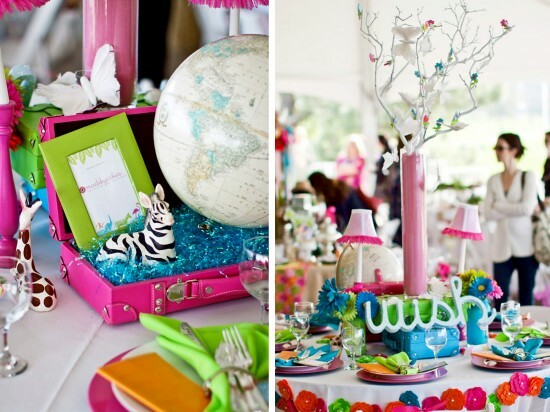 Maddycakes took us on vibrant safari with her eye popping use of color and fabulous attention to detail. Check out those felt flowers around the lip of the table! SUNSHINE Safari is right! 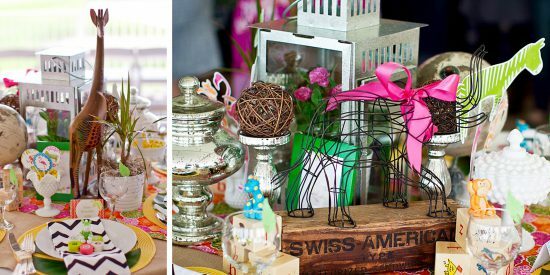 We could not miss this amazing table from Hostess with the Mostess (and not because it was right next to our Zebra table). 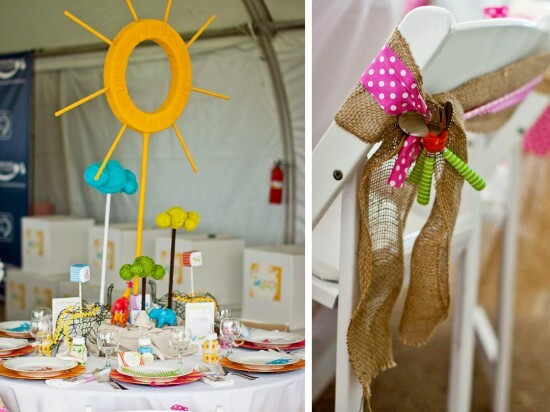 The bright, yarn wrapped sun centerpiece shone in a room full of beautiful designs. Favorite party favor of the day-her chair backs with PBK cutlery! Still more to come! A post with smiling moms, and sweets galore!